Giovanni di Bernardone was born in Assisi in 1182. He was the son of a successful cloth merchant who traveled throughout southern Europe. The boy was given the nickname of Francisco, reflecting his mother’s French heritage. He enjoyed some privilege as a youth, and even entered the militia for a time, until he came upon a spiritual crisis. Having a sense of sympathy for those around him who were suffering, he lost the taste for the ‘high life’. Francis set about with enthusiasm, begging for stone and building materials, and did quite a job on the chapel. Some time later, again kneeling in prayer, he was given a second commission: “Francis, repair my church.” There was a deeper meaning in it this time, and his lifelong calling was established. As he went about in service to his fellows and the church in general, several followers joined him. He called his group the Friars Minor, or the Lesser Brothers, as a gesture of humility. Saint Francis was walking once with another companion, where a great number of birds were nesting amongst the rushes and singing. Saint Francis commented how the birds were praising their Creator and both proceeded to go among the birds and chant the Lauds and the canonical hours. However, the birds did not fly away on their approach but kept up such a twittering that they could not hear each other’s responses. Addressing the birds, Saint Francis asked them to stop singing until he and the friar finished the praises they owed to the Lord. The birds at once fell silent and remained so until Saint Francis and his companion had finished saying the hours and chanting the Lauds. When finished Saint Francis gave the birds their leave to sing praise in their own fashion to the Lord, where they at once resumed their singing. 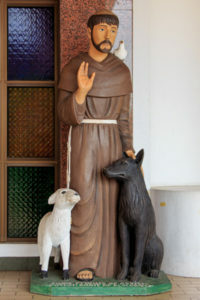 In another story Saint Francis is traveling with his companions. As they are passing a certain village, he takes notice of a large flock of birds of different kinds gathered together. He leaves his companions and walks eagerly towards the flock. He gives them his accustomed greeting and is surprised that they do not fly away as they generally did. Saint Francis starts talking to them, stating that they ought to praise and love their Creator because they have been given feathers for clothing, wings for flying, and everything they need. He continues to tell the flock that they have been made the noblest of creatures because the pure air has been appointed as their habitation. Without them having to sow or reap, they are watched over and guided. Reacting to his words, the birds rejoice in their fashion, stretching out necks and spreading wings, opening beaks and looking at Saint Francis while he goes back and forth among them. He strokes their heads and bodies and finally makes the sign of the cross over them and sends them away with his blessing. SULTAN: Well, little man, I see you have courage. I watched your nervous walk and steady eyes, and I said to myself, him I would like at my court. He would tell me the truth, and not what I usually hear. He emphasizes the last few words, his eyes roaming over his own court, filled with yes-men. Francis says nothing. SULTAN: I see you also have manners. I like that. Long pause, embarrassing only to the sultan’s sycophantic courtiers. SULTAN: Well, holy man, what do you want of me? FRANCIS: Only to bring you peace, great one. SULTAN: (Smiling) But I like war, little Italian. For Allah I am conquering the world. It is why I was born and why I am Allah’s instrument. FRANCIS: But, great Prince, I am not talking about peace as the opposite of war. I speak of peace in your heart, a deep satisfaction and joy that flows from within like a rich wine. SULTAN: And what, to a warrior, can bring more inner peace than victory on the battlefield? FRANCIS: Prayer, O child of Allah. SULTAN: Prayer? And do I not pray every day to Allah? FRANCIS: More, I am sure, Great leader, than many Christians pray. But I want to share with you a prayer I learned by fighting the great battle within my own self, by conquering one by one the demons in my own heart. Your prayer is good, I am sure, but I want to teach you a new prayer. SULTAN: Then pray it for me now, here in front of these dullards who infest my tent. SULTAN (Obviously moved, in a soft voice, so only Francis can hear): Oh, little beggar and man of dreams. I wish in my heart that there were more gentle men like you to balance the hatred in the world. Unfortunately, the world understands only two things: power and violence. Some day, your prayer says to me, the world will be turned upside down by little men who fast and pray and who die rather than take up the sword. Till then, God’s will is performed through violent men like me. FRANCIS: Will you, Lord Sultan, pray for that day? SULTAN: I will do more, honest man, I will let you walk out of this camp alive, so that you can pray for that day. What I pray for is that one day after I have gone from this earth (but not before) Allah will change his mind and use meek instruments like you and that this great army of peace-loving beggars will outnumber the forces of hatred and violence. Go to your dreams, brave little man. SULTAN (In a loud voice, so the whole court can hear): Take this fool from our camp and give him safe passage to his own kind: I will not lower myself by harming beggars and vermin and threadbare Christians. You can see from this man’s appearance how badly we have beaten down the Christians. Go. The Sultan winks at Francis, and Francis smiles back. In the strictest display of diplomatic chivalry, Francis backs out of the tent. This little poor man from the hills of central Italy leaves us with a clear, strong example of spiritual power which can be a real comfort in times of loss or need. We have chosen his name for our company to remind us of his principles. Stephen Clissold, The Wisdom of St. Francis and His Companions, New Directions Books, New York. Source for first two stories. Murray Bodo, Francis: The Journey and the Dream, St. Anthony Messenger Press, Cincinnati, OH. Source for the third story.